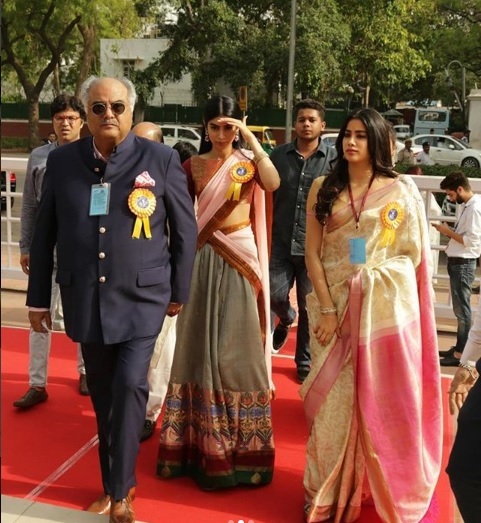 The 65th National Film Awards 2018 ceremony was held yesterday at Vigyan Bhawan in New Delhi. Late actress Sridevi was honored with the National Film Award for Best Actress role in Mom. 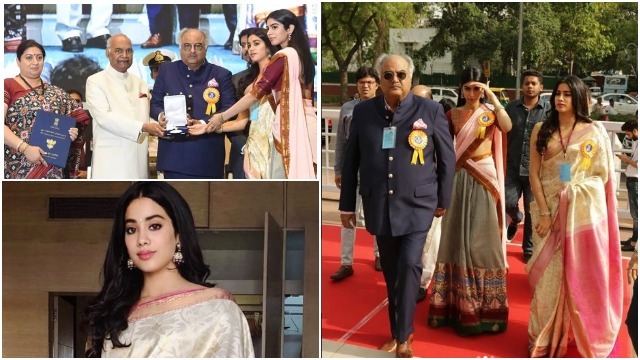 After her tragic death of two months, Sridevi’s daughters Janhvi and Khushi and husband Boney Kapoor collected the late star’s Best Actress National Award at a ceremony in New Delhi’s Vigyan Bhawan on Thursday. 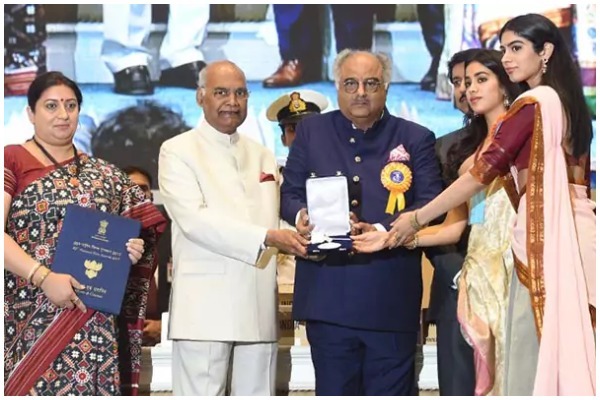 It was an emotional as well a proud moment for the Kapoor family as late actress Sridevi was no more with them to share the happiness and accept her 65th National Film Award by herself. 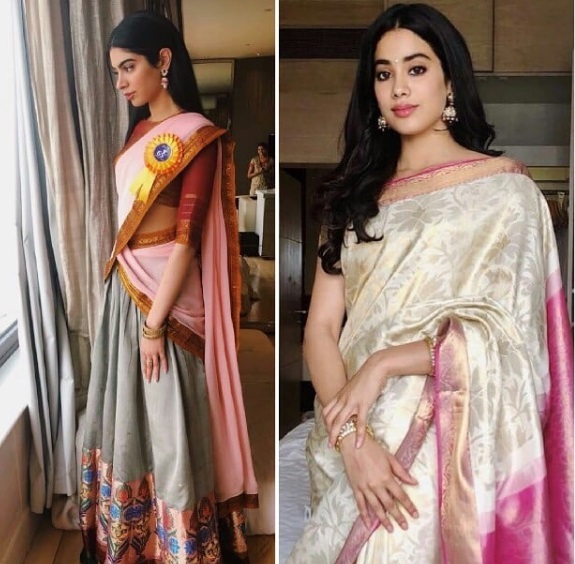 Janhvi Kapoor wore her mom Sridevi’s saree for this special occasion. 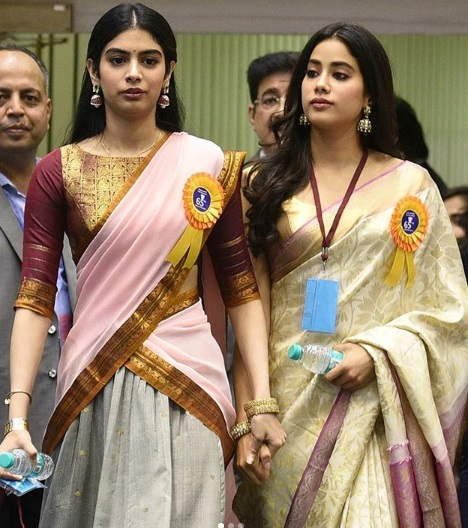 Designer Manish Malhotra, who was Sridevi’s close friend and favorite designer, posted this picture of Jahnvi kapoor in Kanchivaram saree. Sridevi had wore this same saree during one of the event. Apart from Sridevi, Vinod Khanna, who passed away last year, was honored with the Dadasaheb Phalke Award – India’s highest film honour. The award was collected by Vinod Khanna’s son Akshaye Khanna, and wife Kavita.